Robotic / mechanical components and kits. 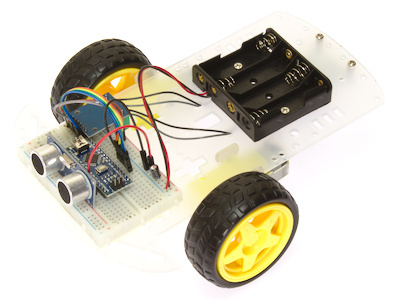 This robotic car kit is a complete kit of parts, including electronics, that will allow you to build a working robotic vehicle capable of traversing a flat surface whilst avoiding solid objects. The kit is aimed at both beginners and intermediate users who are looking for a low cost way to experiment with microcontrollers and robotics. Based around Arduino compatible hardware, the kit comes with an Arduino compatible Nano microcontroller which has been pre-programmed with a demo obstacle avoidance program (sketch), so for beginners no programming knowledge is required to use this kit. For intermediate users who have some basic experience with Arduino microcontrollers, the kit includes everything necessary to allow you to modify or write your own sketch using the freely available Arduino Development Environment. 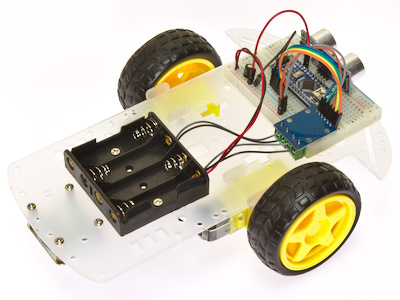 To help with writing your own sketches we have also written an Arduino compatible library that adds simple commands for gaining full control of the cars motors and Ultrasonic sensor. The library together with the pre-programmed demo sketch shipped with the kit can be downloaded from our support forum (see link below). 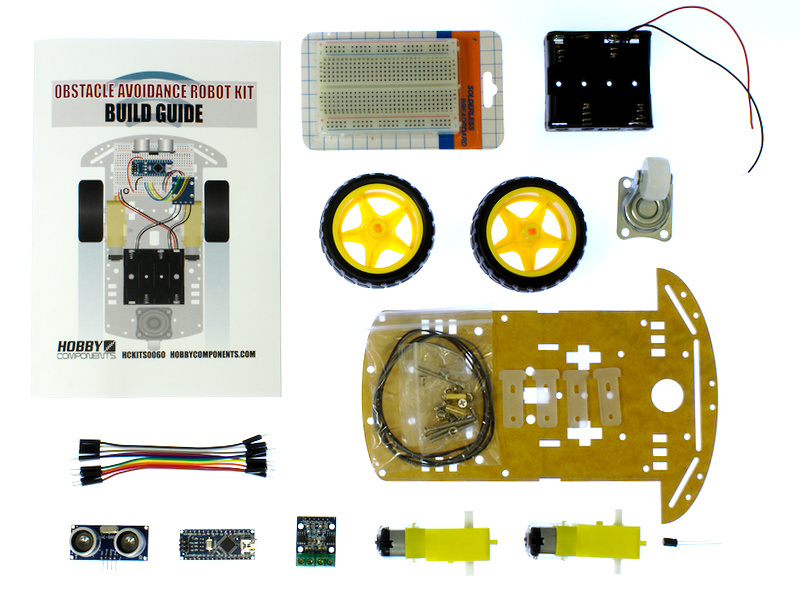 Construction of the robot car has been made as straight forward as possible and the kit includes a printed step by step construction guide. Chassis parts can be constructed just using a screwdriver and all the electronics are designed to be connected together via a solderless breadboard (however we do recommend securing the included motor wires to the motors with solder). Disclaimer: Libraries, example code, and diagrams are provided as an additional free service by Hobby Components and are not sold as part of this product. We do not provide any guarantees or warranties as to their accuracy or fitness for purpose. Did not work at first, due to source code wasn't downloaded in Arduino Nano on purchase, had to reload source code and it now works fine! Sorry about this, we know that a handful of kits (< 5) from an older batch did go out without the Nano being pre-programmed. Hope it wasn't to must trouble to figure out and glad it's working for you know.